Letter to the Easter bunny asking specifically for a white bunny. Evan thinks Easter eggs are for jumping on, not eating. The smashed eggs got fed to the kitties. Hailey got a new book, a new ballet outfit, ballet dvd, and a white bunny. Evan got a new book, a set of trucks, and a white bunny. Ready to go to church. 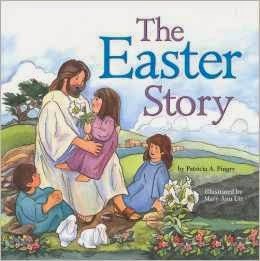 This is my favorite Easter book to read. The pictures are all watercolors. The text is short and simple. Resurrection treat. Who doesn't love Jesus standing on a donut? You are supposed to spread green coconut around the bottom... as you can see we didn't bother. The kids had fun looking for eggs. We had so many treats these last few days I didn't want to overdo it on the sugar. Don't want to be a joy-killer either. We only bought two bags of candy in addition to the kids' white chocolate bunnies. I knew all the candy would be gone in two days at the most (That's a good thing). I read food labels on everything we eat and I didn't want lots of processed candy.... so we went for more natural treats. 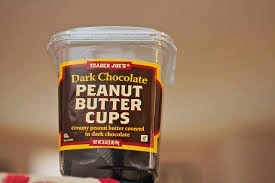 We picked up a container of peanut butter cups and bag of jelly beans from Trader Joes. 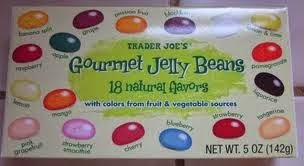 Steve said these were the best jelly beans he has eaten. Instead of food dye they were colored & flavored naturally with fruits and vegetables. Some of the interesting flavors/dyes come from black currants, carrots, hibiscus, pumpkins, gardenia extract, apple, and radishes, to name a few.